A beautifully restored 400 year old house located at the centre of the award winning village of Palairac in the High Corbieres region of Languedoc. The house can sleep 10 people comfortably and offers all modern amenities with spacious accommodation on three floors. 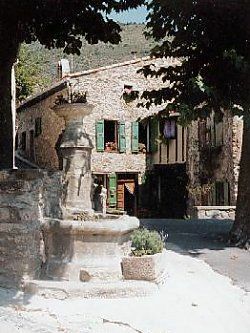 The village of Palairac is in the heart of Cathar Country with the castles of Perepertuse, Aguiler and Queribus nearby. There is opportunity for walking, and riding in the immediate area and swimming in local pools and nearby rivers and gorges. The area is particularly popular with on and off road cyclists. (The Tour De France passes through nearby villages most years)The sandy beaches of the Mediterranean are within an hours drive. The nearby towns of Tuchan and Pazioles are 15 minutes away and offer good shopping, bars and restaurants. There is more comprehensive shopping, including superb French markets, at Narbonne, Lezignan, Perpignan, Carcassonne and Ceret. We live in Oxford with our dog Sancho near to our 3 children and 5 grandchildren. We spent many holidays in France before deciding to buy a house there when we retired and sold our family home. We keep a small cottage base in Oxford but spend a good part of the year in France. Our home in Palairac is now where the family gather for occasions throughout the year. We love old houses with a history and fell in love with this house on first viewing. It feels cosy but can accommodate all our family with bedrooms and bathrooms to spare. The village is uniquely beautiful and the people are so friendly,(a mixture of French, Belgium, English), we felt right at home as soon as we moved in. We can fly from the UK into Carcassonne, Bezier, Perpignan, Gerona, (Barcelona), Toulouse or Montpellier so always have a wide choice of cheap tickets. We then drive for an hour through stunning countryside to the village. We like its remoteness because the roads are virtually empty even in high Summer, and except for the odd bicyclists, (The Tour De France passes through nearby villages every year), there is almost no traffic at all through the village itself. This village has been inhabited for over a thousand years and the 12th Century church, is the centre of many mysteries. Because of its antiquity, no modern building is allowed in the village. Nothing is spoiled. My family love walking in the hills surrounding the village which are full of wild flowers and shrubs and quite spectacular in the Spring, early Summer and Autumn. The grandchildren play out in the village and surrounding hills and woods, taking picnics, making camps and generally exploring. In the Summer we go swimming in the nearby rivers and local pool where we meet lots of people over drinks and food in the outdoor cafe. We are always captivated anew by the unique beauty and total peace we find when we arrive back in Palairac. Bedrooms 1, 2 and 3 have en-suite bathrooms with toilet, basin and shower. Family bathroom with bath, shower, bidet, toilet and basin. Notes on accommodation: Electric heaters, wood for stoves provided. Pets allowed. No smoking except on roof terrace. games, puzzles, travel books and maps provided. beach towels, and beach and picnic equipment provided. Outside: There is a sitting area outside the front door that overlooks the fountain in the small village square. The roof terrace is very spacious and is good for eating out and sunbathing with nice views of the hills and the village. The village itself is small but beautiful and boasts a 'fleurie' award for one of the prettiest villages in Aude. Utility Room: Washing machine and dryer. Iron, ironing board. Cleaning / Towels / Linen / Maid service: All linen provided, including beach towels. Cleaning before arrival and after departure. Other: Large,light and airy sitting-dining room on 2nd top floor(with 2nd kitchen adjacent). Wood floors, beamed ceiling, wood burning stove and French doors to spacious roof terrace. Music centre, games, toys, puzzles, barbecue and terrace furniture. Beautiful house in friendly village. This house is a gem in beautiful countryside, great walking, relaxing on the terrace or chatting with the locals. The house itself is equipped with everything you could need and the housekeeper lived just up the road and was very helpful. Bear in mind that this place is tucked away in the hills and it is a twenty minute drive to the nearest shop so you need to be organised with shopping! We tend to do a big shop in the hypermarket at Narbonne or Perpignan then top up from the local shops in Tuchan and Pazioles. The butcher in the Spar at Tuchan has very good meat and also local eggs. Veg are better at the shop in Pazioles and its nice to have a coffee at the bar across the road. The bread van which delivers on Tuesdays, Thursdays and Sunday can also save a trip but the drive down to Tuchan is beautiful and usually traffic free so we are used to shopping almost daily. The covered market in Narbonne is worthy of a days outing. Try to arrive by 11:00 and have lunch in the market. Le gite de Palairac, bien situé pour toutes nos balades, est spacieux et très confortable ; on peut s'isoler ou se retrouver dans la salle ou sur la terrasse. Le village est calme et nous avons fait plusieurs balades autour du village. Tout était réuni pour que nous passions de très bonnes vacances. Merci Jane pour nos échanges de mails et pour vos réponses rapides à toutes nos questions. It is so nice to know that others have enjoyed our home away from home. I am glad that your holiday was everything you hoped for. Nous avons passé un excellent séjour à Palairac . La région magnifique nous a enchantés et malgré le temps quelquefois incertain, nous avons fait de magnifiques balades, ( re ) découvrant les châteaux Cathares , des paysages splendides, ainsi que les étangs du bord de mer . La maison spacieuse et confortable, dotée de tout ce dont nous avons eu besoin, nous a permis de passer une semaine des plus agréables dans ce petit village sympathique . Seul bémol : le fait que Abritel prélève le montant de la location en livres ( 657,46 livres correspondant à 781,01 euros , alors que l'annonce publicitaire annonçait 7 nuits à 105 euros soit 735 euros ; nous avons donc réglé 46 euros en plus, ce qui n'est peut-être pas beaucoup, mais ne nous semble pas correct . En tous cas nous remercions vivement la propriétaire Mme Jane Venable . I am so happy that you found our house to be all that you had expected and that you enjoyed staying in our lovely village. I am sorry that you had difficulty regarding the payment which was done through Abritel. I have spoken to them about this and they assure me that such confusion will not occur in the future. Mediterranean beaches along the coast between Narbonne and Perpignan and south to the Spanish border provide long stretches of sand as well as resorts with every kind of beach cafe and water sport. 1 hour drive. Cheap flights are available to both Carcassonne and Perpignan, (Ryan Air) 1 hour drive. You can also fly to Toulouse or Barcelona, Girona or Montpellier: 2/2.5 hours drive. Shopping, banks, chemist, tabac, restaurants and bars in Tuchan or Pazioles; 20 minutes drive. Narbonne, Carcassonne and Perpignan, one hour drive. Spanish border, 1 hours drive, Barcelona, 2.5 hours drive. There is excellent walking/hiking and cycling from the village and 'serious' hiking from marked trails in nearby villages. The countryside lends itself to both on and off-road cycling.This is also a popular area for birdwatchers. Horse-riding in the Corbieres is available during the Summer and there is a very fine stable only 5 minutes drive from the house. Swimming in nearby river pools and gorges is popular and there is a local swimming pool with a cafe bar at the campsite in Tuchan, 20 minutes drive away. The food is nice here, the pool lovely and safe for children. In addition to the spectacular castles for which this region is known, there are many sites of interest within an hour or 2 of the village. These include the Romanesque Abbey of Fontfroide and the walled city of Carcassonne, the spa town of Rennes Les Bains and the mystical village of Renne Les Chateau. Lagrasse with its medieval streets and famous abbey is 0.5 hour away. Tautaval, Narbonne and Perpignan offer museums, culture and good eating. Further afield, is the pretty town of Ceret with its famous Museum of Modern Art and over the border in Spain you can visit the Dali Museum in Figueres. Wine tasting in the many caves of the Corbieres region is also a very pleasurable way to spend an afternoon and there is a vast selection of wonderful small restaurants located in picturesque villages that dot the region. Our visitors have enjoyed the quiet unspoiled ambience of Palariac and the friendly welcome that is a feature of this small village. Roads are virtually empty even in the high season which, together with the dramatic scenery, makes touring in this region so attractive. The house is an ideal place to enjoy the company of friends and family with room for all to relax in the comfort of a real home. Booking Notes: 25% of the rent is payable at the time of booking and the balance is due 6 weeks before the start of the rental period. £100 security deposit is also required, which is returnable after the completion of your holiday. Changeover Day: The house is available to rent weekly from Saturday 4.00pm to Saturday 10.00am during the high season. There is more flexibility with longer term lets and when booking in the Winter and Spring. Notes on prices: Reductions available for 4 persons or less in low season and for longer term lets.